Well, we made it! You are one year old. What a year it has been, little lamb. This month has reminded me how much FUN this age is. She is a daddy's girl and he LOVES it. She took her first beach trip! She loved the sand for about 10 minutes and then was OVER. IT. Daddy got to spend some quality time with her in the pool. She loves to just walk around, especially outside. As with any one year old, she loves to put everything in her mouth. Except vegetables. How convenient. She thinks it's hilarious to pat people on the stomach. If you ask her where her belly is, she'll pat her own belly. SO CUTE. She loves her baby doll. She loves to play with her toys phones - she'll "answer them" and walk around. Honestly, her favorite toy is whatever big sister is playing with. Neither one of them love sharing, which consistently leads to ear-piercing screams from Emerson and fits from Aiden. YAY. She loves to come over to me when I'm laying down and sit on my stomach and bounce. She thinks it's hilarious. She also loves peek-a-boo, lady ride and patty cake. She's as strong-willed as ever! 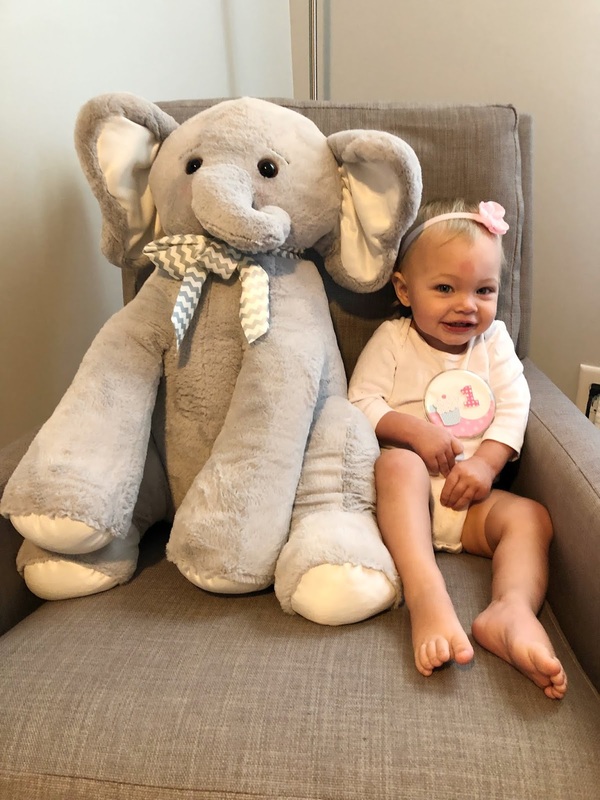 She's coming in at 30.5" tall (89%) and weighs 21 lbs 8 oz (74%). Emerson, we love you! You are getting more fun and interactive by the day and we can't wait to watch you continue to grow into a little lady. I cannot believe you are already ONE!